Born on 14 October 1892 in Wetheral, James Hall was the son of Isaac and Margaret Hall who had married in 1870. Isaac and Margaret had a total of nine children, eight of whom were still alive in 1911. Isaac worked in the leather trade as a currier who would have been involved in the final stages of treating the leather. James’ older brother, Robert, followed his father into the leather trade but James chose a career in teaching. By 1910 James had left the family home to live at Bede College, a teacher training college in Durham. 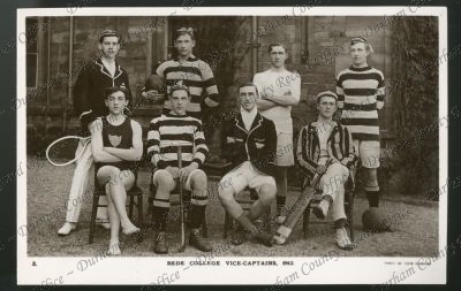 Whilst at Bede, James was a keen sportsman, playing for the college’s rugby, hockey and cricket teams. Following his training, James left the college to become a schoolmaster. At the time of his attestation in 1914 he was working in a school in Maryport in Carlisle. Following attestation into the Durham Light Infantry (DLI) on 10 September 1914, James was mobilised around two weeks later. He became part of the 18th Battalion DLI, serving as a private with the service number 18/1060. This battalion began training at Cocken Hall near Durham in September 1914, and by the end of the following year were ready for service. James began his service abroad on 4 December 1915 when the battalion initially went to Egypt to help defend the Suez Canal. A few months into 1916 the battalion left Egypt for France to begin their service on the Western Front on 5 March 1916. There are reports of an injury in James’ service records occurring on 27 or 28 July 1916 and also a mention of a shrapnel wound. There are no further details regarding these injuries so it is not clear whether they are the same injury or whether either of them were related to the incident reported by Sergeant Sanderson. The article written by Sanderson gives a vivid picture of the raid and the full article is attached. James had indeed been captured on 1 March at Gommecourt and was a prisoner of war in Dulmen. He had been badly injured by a bullet wound to his arm which led to the amputation of his left forearm. By December 1917 James was a prisoner of war at a camp in Soltau. A fellow Bede scholar, William Johnson Gibbons, wrote that James was “at present awaiting exchange on account of the loss of an arm.” James returned to England on 20 January 1918 and on discharge returned to Maryport. In 1921 in Kendal James married Sarah Ann Dockray, a daughter of a police inspector, who was also born in Cumberland. James’ amputation did not stop him teaching and at some point he returned to work as a schoolteacher. At the time of the 1939 Register, James was living with his wife, Sarah Ann, in Cumberland and working as an elementary schoolteacher.